The Milk Protein soothes the scalp and while it strenghtens your hair, it also adds great shine. The Olive Oil part promotes a healthy scalp, which is really good for me. It repairs damage and also adds shine. I'm growing my hair out so this really helps. The last thing included is Omega 3. The Omega 3, rebuilds strengthens, and protects hair. 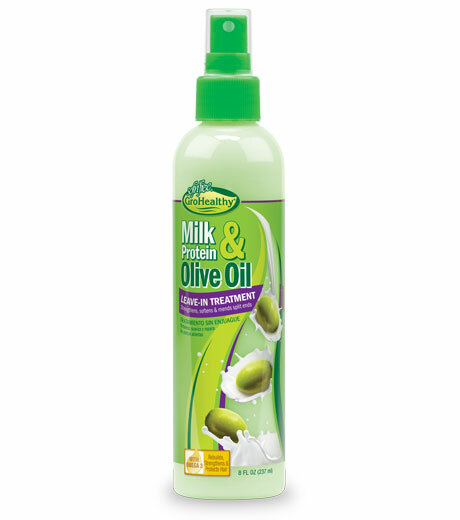 The milk and protein olive oil helps repair breakage in your hair and it also smells really good. I have been using this for a long time and it helps my hair a lot. Directions: Shake well to activate, mist onto hair after every shampoo and conditioning. Love it! My hair tends to be picky when it comes to product. My hair is picky too sometimes, so when this worked for my hair I loved it! I could definitely do with this in my collection. My hair is a nightmare lately. You should try it. It really works!